I'm rather embarrassed to admit that in July 2014 Mr. Curtis and I began to remodel our hall bathroom, an effort which took until December 2015 to finish. It's more embarrassing because Mr. Curtis grew up in construction. His father still has his own business and his brother remodeled a 100 year old 10 bedroom home into a bed and breakfast in less than a year. If we'd tried that at our pace, it would take us 15-20 years! In our defense, Mr. Curtis started a new job in August 2014 and I wrote a lot of books while he was occupied learning the ropes. Here's what the bathroom looked like originally and how I looked when Mr. Curtis insisted I scrape the glue from the floor (since he had to remove the toilet). Tally decided it was naptime and hopped into my lap. Note the lack of protective gear - no shoes, no gloves, no glasses. No romance authors or puppies were injured during this renovation. Sometimes it pays to be lucky! Little did we know that the bathroom floor was no longer level. Trouble ensued with the "self leveler", which didn't level anything - it just made the high mound higher. A second round of leveling made things much better. We've since learned we could have rented a concrete grinder (not really sure that's what it's called). Might have been easier, less messy and less stressful. Next we tiled, using our brand new tile saw. We had an argument over which spacers to use. I prefer thin spacing. Mr. Curtis likes wide spacing. We went wide (this time). Does anyone see a problem with the way we started? Yep, we made tiling difficult. Should have started with the row to the right and moved to the vanity/toilet area (Mr. Curtis was putting off making fancy cuts as long as he could). Why do it that way? Because you can't tile by kneeling on freshly laid tile. We ended up tiling from the toilet and coming back to the project the next morning. In the meantime, the doors to the vanity and old hardware were removed, sanded and painted by me. Luckily, Mr. Curtis insisted on saving the old hardware and screws. Apparently, they don't make the hinges for this vanity anymore. We went on a scavenger hunt to find something that would work. And when it came time to install new handles, the screws were too short - but those screws Mr. Curtis wisely saved worked just fine! When we moved into this house 23 years ago, the bathroom had a wallpaper strip that came off when the kids took showers. I put up this one about 22 years ago and proudly told Mr. Curtis it would never come off (thinking we'd move before it came to that). Well, it took more than soaking with wallpaper remover, then fabric softener, then just plain water. It took scraping off with the utility knife (note the gouges - which had to be filled and then re-textured; luckily, there is now a great can of spray texture on the market). Unfortunately, putting in the beadboard meant we had to remove the toilet tank on the new toilet, which then sat in our bathtub for a month until Mr. Curtis worked up the courage to tackle the angle cuts on the baseboard. After the beadboard was finished along with chair railing and baseboard, Mr. Curtis tried to re-install the toilet tank using the rubber seal that had been sitting out for a month. He tightened the screws so forcefully, the tank cracked. So we had to order a new toilet tank. And I had to scrub the bathtub because those blue tabs you use to keep the toilet bowl clean? It all comes out when you turn the tank upside down. Fun times! Have you ever attempted a DIY project that took longer than you planned? I'd love to hear about it! Melinda Curtis is an award-winning, USA Today bestselling author of romantic comedy. Given her life seems to be a comedy of errors, this is fitting. 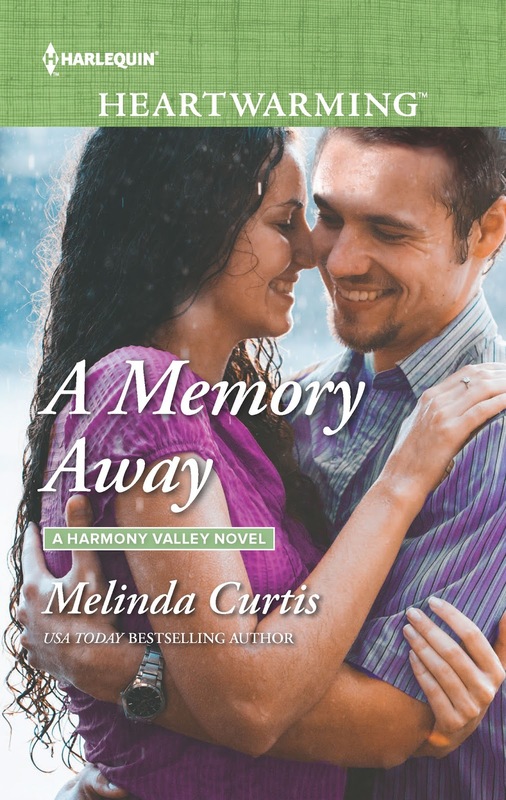 Her latest release - A Memory Away - is a fun story about a pregnant woman who wakes up from a car accident and can't remember how she got pregnant. You can find A Memory Away at all etailers and in print at Super Walmarts! Remember to sign up for Sweet Romance Reads newsletter in the bar to the right. It comes out a few times a year with free short reads and great features! Oh, this is soooo my life! I've been caught in so many renovations that they bring shudders of horror to my heart. My last big project was scraping, plastering, and painting all the popcorn-textured ceilings in my house (whoever invented that nasty substance deserves a terrible fate!). When I was finishing the very last ceiling, I thought, 'Hm, I wonder if there was any asbestos involved in those ceilings?' Always thinking, that's me. Mel, I did it all and sympathize. Actually scrapping off the wallpaper was my job--for the whole house. My daughter who was a toddler at the time helped by splashing the wall with water or pressing a wet sponge on it. It worked well until she later fell in the bucket of paint. But my hubby insisted we worked day and night until it was done. No procrastination allowed. Your bathroom looks great so it was all worth it. My husband and I "flip" homes. Before you get the idea that our business is like the HGTV show, Flip or Flop, think again. One of the homes we recently "flipped" was about to be condemned. Yikes! Needless to say, it was a lot of work. Wow, Josie! I find all this flipping and fixing fascinating. It isn't for the feint of heart. Good luck to you!